while they cope with a challenging situation and help prevent or reduce the stress caused by a change in their environment. Directions: Change diffuser refill every 30 days, covers up to 700 sqft. 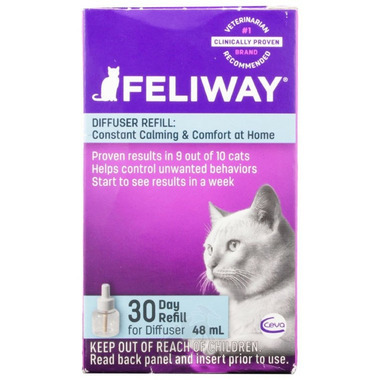 Ingredients: Refills have F3 feline facial pheromone analouge at 2% and Isoparaffinic Hydrocarbon at 100g. Caution: Harmful or Fatal if swallowed and enters airways. Contains petroleum distillates ( i.e Isoparaffinic Hydrocarbon). Keep out of reach of children. The danger is linked to penetration of liquid into the respiratory tract after ingestion and swallowing the wrong way. Read label and insert prior to use. Call physicaian immediately if ingested. Do not induce vomiting. Store in well-ventilated area. Dispose of contents/conatiner in hazardous or special waste collection point, in accordance with local regulations.